Central Avenue is the dividing line between northeast and southeast Minneapolis. 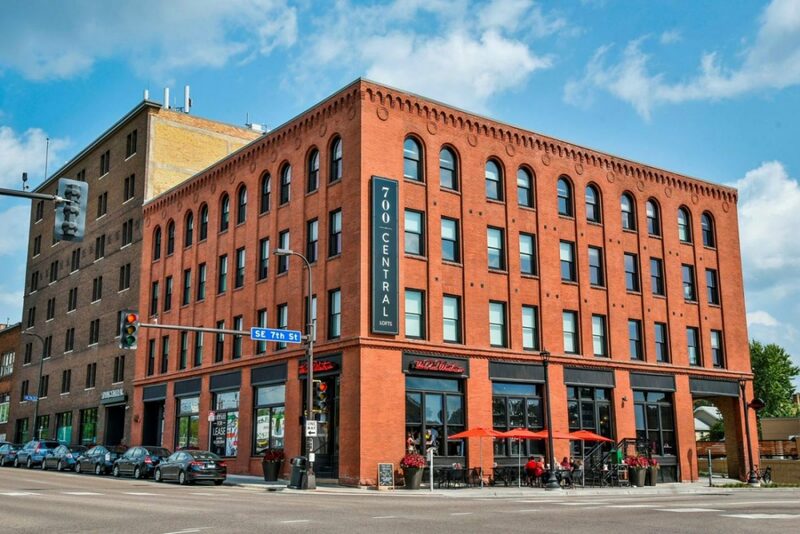 It was along this important commercial artery, at 700 Central, that McLeod and Smith decided to build a new four-story, timber-frame headquarters in 1897 and a five-floor reinforced-concrete addition in 1909. By the early twenty-first century, the property was vacant, a blight on a prominent corner of a neighborhood in transition. Thankfully, Nolan Properties Group and Bader Development recognized the potential of this site, purchased the building and vacant lot out of foreclosure, listed the property in the National Register of Historic Places, and, with the aid of historic tax credits and environmental brownfields grants, launched a renovation. It was not an easy project. The two structural types—timber frame and reinforced concrete—demanded different apartment layouts and different treatments for floors, walls and ceilings. The timber structure of 700 Central was failing, requiring extensive structural reinforcing to be introduced, as unobtrusively as possible, to tie the building back together again. One of the most challenging aspects of 700 Central was appropriately removing environmental contaminants from the building using methods deemed appropriate by the State Historic Preservation Office and the National Park Service. It was required that the environmental remediation minimize impact to the building’s historic character, while also effectively removing all contaminates. For example, the interior of the buildings had many areas with multiple coats of lead-based paint that required removal. Removing lead-based paint from surfaces that are over a hundred years old while not damaging the substrate was extremely time consuming and detailed work that dictated the overall construction schedule for the project. Another challenging aspect was removing environmentally impacted soils to a depth of approximately 25 feet adjacent to the existing historic buildings on one side and commuter heavy 7th street on the other side. This required precise planning, engineering, environmental oversight, and constant construction management adding to the complexity of this redevelopment. Greiner Construction was given specific direction that nothing be removed from the site until owners had a chance to weigh in and find a new place for any significant demolition materials or historic features. Everything from the fire doors to the original freight scale for the furniture manufacturer that previously inhabited the space are now featured throughout the project. In addition to the reuse of this building, this project is currently 34% more energy efficient than the baseline energy model that was produced at the inception of this project. The unique original character of 700 Central is now being rediscovered and new energy infuses the area. This urban renewal mixed-use project significantly benefits the community, the city and a major county corridor by renovating a high profile, blighted property into an attractive, pedestrian-friendly, transit-oriented project that injects life to the street-level, promotes the objectives of both the neighborhood and city, creates jobs, cleans up environmental contamination, increases the tax base, and provides a catalyst for additional urban renewal projects on adjacent sites. In 2017, 700 Central won a Minnesota Brownfield’s ReScape Award.